Non-silicone based, long life and 100% synthetic, DOT 5.1 BRAKE FLUID conforms to the highest standards in brake fluid performance. DOT 5.1 is specially designed for Anti-Locking Brake Systems (ABS). Price is for a 500 ml. (16.9 fl. oz.) bottle. 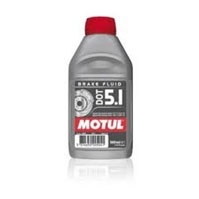 Motul 5.1 Dot Brake Fluid.